MediaInfo has been 'bundling' crap (in the installers) for a while now, read here. You don't want the installer. I don't recall seeing 'mediaarea.net' in the links before, it could be only a backend for MediaInfo or a partnership, just not sure. I go to SourceForge for the downloads, hopefully this will stay put. 1) As of June 10, 2013, the download link points to a "file downloader", not the actual MediaInfo that you expect. 2) Careful: when you install MediaInfo (the file that was downloaded by the downloader), it installs by default the AVG toolbar and other things you did not ask for. Read carefully before accepting. x64bit download link was linked to Version 0.7.54.
the main link was to Version 0.7.57. Before running the program, please create a file named MediaInfo.cfg inside the Plugin (folder presents in the main program folder). Isn't this already stealth with Winpenpack instructions? 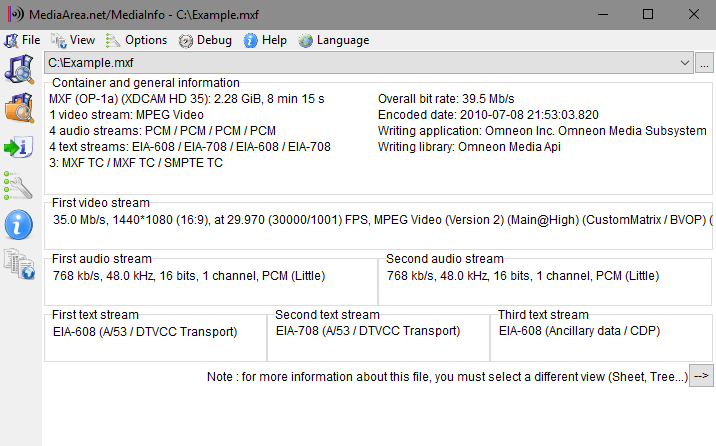 Does anybody know a program that does the same as MediaInfo but for image files (jpg, bmp, png, etc.)? I would need something (ideal would be in a tooltip like MediaInfo or a menu in the Windows context menu) to show the selected image file information (size, color-depth, format). I have tested ShellPicture (by Babex) but I am allergic to shareware developers (in general) who UPX unknown stuff into .exe/.dll files, so I stopped using it. just tried to convert e.g. "Patent_Absurdity_LQ_350kbit.ogv" into "mpeg4-aac.mp4" (for smartphone) - all failed. Who can help? It's great for identifying files that have no extensions. OpenCandy and other such backdoorware doesn't belong in these open source projects. Like someone else suggested, get the 7z version not the installer version. Anybody can suggest a similar app to get ALL info for JPG - BMP - PNG - TIFF? MediaInfo is actually supposed to support these formats but the info supplied is nothing more than the one given by the OS. Why does this page say Version 0.7.28, while the page pointed to by the Download icons says Version 0.7.27? Unicode support is partial. Unicode paths aren't accepted when sent from command line. spchtr> This may be a bug, I will verify the AR on my test files. If you have some problems with this version, you can create a bug report on Sourceforge project page. Aspect Ratio function seems to have changed. Movies that previously reported 2.35 are reporting 16/9 (1.777) which is quite a difference... I use this program to figure AR for MediaCoder when I reencode to mp4. It's not that accurate than GSpot, i.e the bitrate when vbr. Audio and video bitrate was wrong on my test files). BTW, as any player should IMHO.